Welcome to my part 2 of my 50th airline flight experience! For my part 1, please click here. Here are some of the photos of Brunei's Airport. From what I was told, the above photos show the interior of the newly extended building as you can see the check-in counters and the shops are not opened yet. The photos below show the older part of the airport. I am a fan of Jollibee, as I often visit the Lucky Plaza brunch in Singapore. I was at the land side for only 20 minutes before checking in for my return flight. The check-in counters were empty and I went straight up to one of the counters after my luggage and backpack were screened. The counter staff was very nice and we talked a bit about the Boeing 787. However, she took quite a while before my ticket was printed out of the machine and when she handed the boarding pass and passport to me, something caught my eye! The colour of the boarding pass was different from my previous and when I looked at my seat number, 9A! Inside me, I was jumping up and down! This was my very first operation upgrade; the nice lady told me that I had been upgraded and was invited to use the Skylounge. My day just got better from that point onwards! If you go pass the 'Jollibee' restaurant at the 2nd level of the departure hall, you will find a spotting area where you can spot a few aircraft. Not much traffic though. I spent some time at the Skylounge. Can I take this model home? The lounge is spacious and at that time it was empty so I managed to take a number of photos. However, I saw some staff sitting at different parts of the lounge which shocked me. The staff that were handling the food were not friendly and they seemed to want me to go off asap. Shocking service if you ask me. The food is average; nothing much to shout about. Not much selection but at least there were choices of warm and cold food. My empty plates took quite a while to be cleared and mind you there were 4 or 5 staff idling and that's bad! However, when more premium passengers came in, those staff started working and that shouldn't be the way. Gate number 5 for us once again! This time our flight seemed to have more passengers than the previous. Soon it was time for departure, I headed to the gate. I wanted to photograph the aircraft before the light got dark. The same aircraft would take me back to KUL. I didn't know that I would be flying in this class on the return sector, thank you, Royal Brunei for the big surprise! I got to say I like the J class cabin, the seat is very comfortable and there is room of space for everyone so no problem in regards to this area. The cabin is small, with just 18 seats in this business class so that means if you have to book early to reserve your seat. During this flight, there were only 7 of us in the cabin and it seemed only both of us spent more time exploring the features of the cabin. The seat is not lie-flat; its an angled type, not a problem for me. I didn't try sleeping on it but I wouldn't have a problem on long haul flight. As you can see in the picture, how comfortable I was! If you like window seats, you will be pleased to know that you will have at least 2 or 3 windows to yourself. I boarded the aircraft at about 1805 hours and I was the first one to do so. Usually J class passengers enter the first door but because the second door was only in used, I entered it and instead of turning to the right, we turned left instead (Great feeling!). I was led by a female crew to my seat. 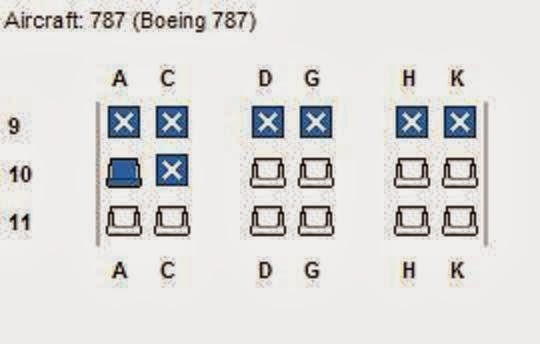 This was when we realized that row number 9 was the first row of the Business Class cabin. While the rest of the passengers were boarding, I took this chance to take more shots! There is a footrest, the touchscreen PTV which is adequate in size for my liking and the magazine holder for you to place your magazines or newspapers. The buttons are for you to adjust your seat or to use the massage which you can barely feel if you ask me. I feel that the Qatar's J class massage system on its seats is better. The inconvenient part about having all these 'stuff' on the side is that when you are an almost lie-flat mode position, you have to adjust it to a up-right position in order to do your 'stuff'. The life vests are at the bottom compartment. This is where the tray will come out from. This is a divider if you want some privacy. Need to use a bit of strength to pull that up. The seat lamp which is commonly found on most J class seats. Quite a cozy and comfortable cabin if you ask me. Unfortunately for me, we didn't experience the rainbow mood lighting on both flights, I should have asked on my previous flight. I got to say Boeing has done very well in this aspect, I feel that the mood light certainly helps to calm one down especially when the flight gets rough or one gets nervous in flying. Our welcome drink and boarding pass! We were asked to choose what we want for our main course. The headphones were handled out and both of us tried it. We found it to be adequate enough to block out any other source of sound. The front cabin of the Boeing 787 is definitely quieter than being the wing section. Menu for today's flight! What's for dinner? My first time having 'Teh Tarik' at FL430! In addition to these, we were served with assorted rolls and garlic bread and I chose my favourite ginger beer for my drink. Anyway, once the aircraft was pushed back, we taxied to runway 21 for an immediate take off to Singapore. This time round, the weather was slightly better as it wasn't as bumpy as the previous flight! Once the seatbelt sign went off, the crew started work while both of us reclined our seat and tested the almost lie-flat position and it certainly passed the test. However, I couldn't completely reclined due to my long legs but at least there was ample space for my leg to move around. The J class seat is certainly much better than TG/EK's A380 J class product. While relaxing, the in-flight crew appeared and served us our 'Teh Tarik' and peanuts, she should have told us that our meal service was starting soon. (Actually it was our fault, because we were too comfortable in our position) After 5 minutes or so, she appeared again with our appetiser, and we changed our seat position back to the upright (took a bit of time) and set up the table before our meals were served shortly. The bad thing about this in-flight meal service was I felt pressurized to finish the meal fast, the crew seemed to be eager to clear my meal. Anyway, about the meal, it was quite delicious. I am not a fan of salmon but it was quite ok. The beef was slightly tough but other than that it was delicious. The pineapple tart didn't look too appetising but like the others, it was also delicious. Overall, I think this meal was pleasing for my stomach. As for the in-flight service, the crew was pretty much reserved but they were professional through out. Not a single time, they were unfriendly towards either of us but I wish they would smile more and maybe conversed with us asking us whether we were comfortable and all that. That would certainly made us feel more comfortable. I wasn't sure how many crew were on board this flight, didn't have a look at the Y class section but at least in our section, we were taken care by 2 crew. Since this was a night flight, there is no window shot photos for this report. Anyway, it was nice that we could stay longer in the air as the traffic in KUL was quite busy. As we noticed on our monitor screen that the plane was on a holding pattern a few times. During one of the holding patterns, I had to use the toilet but the crew wasn't too pleased about it. Sometimes its bad to hold it for too long if you know what I mean! At that time were at FL220 so I thought I would make a quick one. We were on the holding patterns at 3 different Flight level before finally started our descend. By then everyone was already seated way before the Captain announced to seat down. Our aircraft landed smoothly and taxied to the gate C5, the gate we boarded earlier on and that was the end of our fun day! How time passed so quickly when you have fun! It was a nice surprise from the airline to give both of us operation upgrade for this sector. To be able to sample both class products was definitely thrilling. I think the airline has done well in designing their new products. Even though the Economy class is in a uncomfortable 3-3-3 layout, but the 33/34 inch seat pitch, comfortable seats and decent IFE have definitely made up for it. 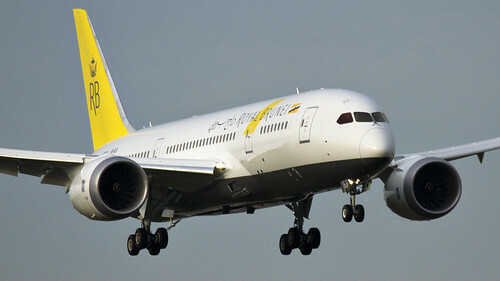 Overall, flying on Royal Brunei's 787 is the deal! It would be starting long haul flights in December 2013, Brunei-Dubai-London would be the starting route and once more aircraft come in, the Dreamliner would fly to Melbourne and other cities would then be announced. The 3rd (DLC) and 4th (DLD) aircraft would arrive in January and February respectively. 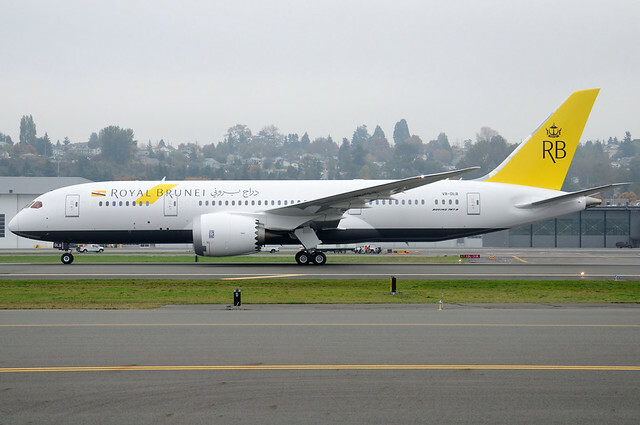 As long as the 787 Dreamliner stay clear of major issues, the airlines such as Royal Brunei would be very please with it and some of the CEOs had mentioned that this aircraft is a game changer and you can see why after flying on it. So, book yourself on one today. 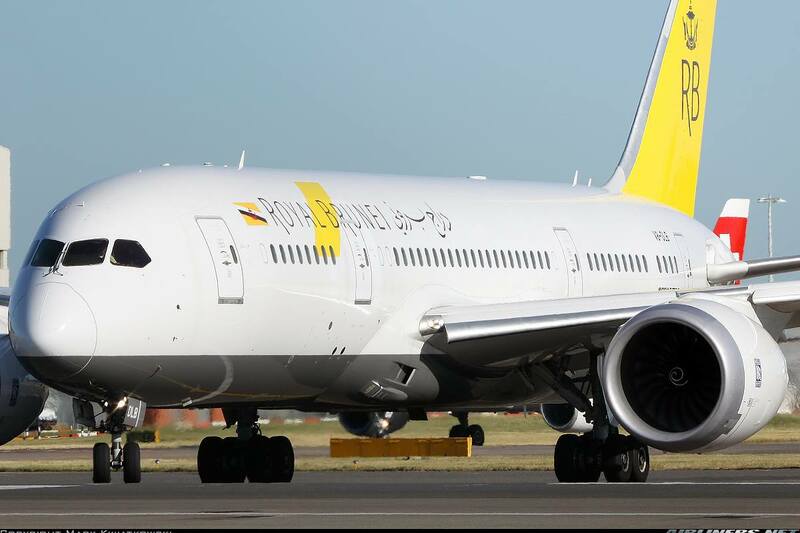 Give Royal Brunei's 787 a try! Thank you for reading my part 2 of my trip report! Hope you enjoy both parts of my 50th airline reports.